April | 2016 | Genesis Nanotechnology, Inc.
Large quantities of steel are used in architecture, bridge construction and ship-building. Structures of this type are intended to be long-lasting. Furthermore, even in the course of many years, they must not lose any of their qualities regarding strength and safety. For this reason, the steel plates and girders used must have extensive and durable protection against corrosion. In particular, the steel is attacked by oxygen in the air, water vapor and salts. Nowadays, various techniques are used to prevent the corrosive substances from penetrating into the material. One common method is to create an anti-corrosion coating by applying layers of zinc-phosphate. Now, research scientists at INM — Leibniz Institute for New Materials developed a special type of zinc-phosphate nanoparticles. In contrast to conventional, spheroidal zinc-phosphate nanoparticles, the new nanoparticles are flake-like. They are ten times as long as they are thick. As a result of this anisotropy, the penetration of gas molecules into the metal is slowed down. The developers will be demonstrating their results and the possibilities they offer at stand B46 in hall 2 at this year’s Hanover Trade Fair as part of the leading trade show Research & Technology which takes place from 25th to 29th April. “In first test coatings, we were able to demonstrate that the flake-type nanoparticles are deposited in layers on top of each other thus creating a wall-like structure,” explained Carsten Becker-Willinger, Head of Nanomers® at INM. “This means that the penetration of gas molecules through the protective coating is longer because they have to find their way through the ´cracks in the wall´.” The result, he said, was that the corrosion process was much slower than with coatings with spheroidal nanoparticles where the gas molecules can find their way through the protective coating to the metal much more quickly. 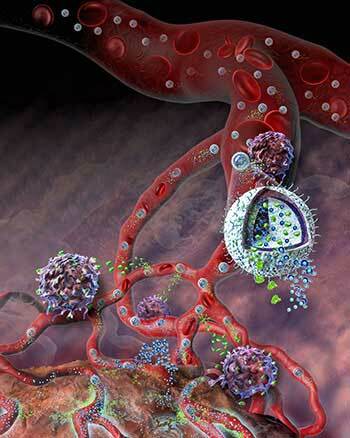 In further series of tests, the scientists were able to validate the effectiveness of the new nanoparticles. To do so, they immersed steel plates both in electrolyte solutions with spheroidal zinc-phosphate nanoparticles and with flake-type zinc-phosphate nanoparticles in each case. After just half a day, the steel plates in the electrolytes with spheroidal nanoparticles were showing signs of corrosion whereas the steel plates in the electrolytes with flake-type nanoparticles were still in perfect condition and shining, even after three days. The researchers created their particles using standard, commercially available zinc salts, phosphoric acid and an organic acid as a complexing agent. The more complexing agent they added, the more anisotropic the nanoparticles became. INM conducts research and development to create new materials — for today, tomorrow and beyond. Chemists, physicists, biologists, materials scientists and engineers team up to focus on these essential questions: Which material properties are new, how can they be investigated and how can they be tailored for industrial applications in the future? Nano safety and nano bio. Research at INM is performed in three fields: Nanocomposite Technology, Interface Materials, and Bio Interfaces. INM — Leibniz Institute for New Materials, situated in Saarbrücken, is an internationally leading center for materials research. It is an institute of the Leibniz Association and has about 220 employees. Researchers have demonstrated that transparent ink containing gold, silver, and magnetic nanoparticles can be easily screen-printed onto various types of paper, with the nanoparticles being so small that they seep into the paper’s pores. Although invisible to the naked eye, the nanoparticles can be detected by the unique ways that they scatter light and by their magnetic properties. Since the combination of optical and magnetic signatures is extremely difficult to replicate, the nanoparticles have the potential to be an ideal anti-counterfeiting technology. The researchers, Carlos Campos-Cuerva, Maciej Zieba, and coauthors at the University of Zaragoza in Zaragoza, Spain, and CIBER-BBN in Madrid, Spain, have published a paper on the anti-counterfeiting nanoparticle ink in a recent issue of Nanotechnology. Whereas previous methods of using nanoparticles as an anti-counterfeiting measure often require expensive, sophisticated equipment, the new technique is much simpler. The researchers attached the nanoparticles to the paper by standard screen-printing of transparent ink, and then authenticated the samples using commercially available optical and magnetic sensors. “We demonstrated that the combination of nanomaterials providing different optical and magnetic properties on the same printed support is possible, and the resulting combined signals can be used to obtain a user-configurable label, providing a high degree of security in anti-counterfeiting applications using simple commercially available sensors at a low cost,” Arruebo said. Although the nanoparticle ink is easy for the researchers to fabricate, attempting to replicate these authentication signals would be extremely difficult for a forger because the signals arise from the highly specific physical and chemical characteristics of the nanoparticles. Replicating the exact type, size, shape, and surface coating requires highly precise fabrication methods and an understanding of the correlation between the signals and these characteristics. Making replication even more complicated is the fact that the combined optical and magnetic nanoparticles are printed on top of each other in the same spot, and this overlap creates an even more complex signal. Another advantage of the new technique is that the nanoparticles are able to withstand extreme temperatures and humidity under accelerated weathering conditions. One of the greatest applications of the technology may be to prevent forgery of pharmaceutical drugs. Counterfeit medicine—which includes drugs that have incorrect or no active ingredients, as well as drugs that are intentionally mislabeled—is a growing problem throughout the world. The researchers plan to pursue such applications as well as further increase the security of the technology in future work. “We plan to add more physical signals to the same tag by combining nanoparticles which could provide optical, magnetic, and electrical signals, etc., on the same printed spot,” Arruebo said. Researchers create perfect nanoscrolls from graphene’s imperfect form. Water filters of the future may be made from billions of tiny, graphene-based nanoscrolls. Each scroll, made by rolling up a single, atom-thick layer of graphene, could be tailored to trap specific molecules and pollutants in its tightly wound folds. Billions of these scrolls, stacked layer by layer, may produce a lightweight, durable, and highly selective water purification membrane. But there’s a catch: Graphene does not come cheap. The material’s exceptional mechanical and chemical properties are due to its very regular, hexagonal structure, which resembles microscopic chicken wire. Scientists take great pains in keeping graphene in its pure, unblemished form, using processes that are expensive and time-consuming, and that severely limit graphene’s practical uses. Seeking an alternative, a team from MIT and Harvard University is looking to graphene oxide — graphene’s much cheaper, imperfect form. Graphene oxide is graphene that is also covered with oxygen and hydrogen groups. The material is essentially what graphene becomes if it’s left to sit out in open air. The team fabricated nanoscrolls made from graphene oxide flakes and was able to control the dimensions of each nanoscroll, using both low- and high-frequency ultrasonic techniques. The scrolls have mechanical properties that are similar to graphene, and they can be made at a fraction of the cost, the researchers say. Stein says graphene oxide nanoscrolls could also be used as ultralight chemical sensors, drug delivery vehicles, and hydrogen storage platforms, in addition to water filters. Stein and Carlo Amadei, a graduate student at Harvard University, have published their results in the journalNanoscale. The team’s paper originally grew out of an MIT class, 2.675 (Micro/Nano Engineering), taught by Rohit Karnik, associate professor of mechanical engineering. As part of their final project, Stein and Amadei teamed up to design nanoscrolls from graphene oxide. Amadei, as a member of Professor Chad Vecitis’ lab at Harvard University, had been working with graphene oxide for water purification applications, while Stein was experimenting with carbon nanotubes and other nanoscale architectures, as part of a group led by Brian Wardle, professor of aeronautics and astronautics at MIT. The researchers’ graphene nano scroll research originated in this MIT classes 2.674 and 2.675 (Micro/Nano Engineering Laboratory). “And you can tune the separation of a nanoscroll’s layers, and do all sorts of neat things with graphene oxide that you can’t really do with nanotubes and graphene itself,” Stein adds. When they looked at what had been done previously in this field, the students found that scientists had successfully produced nanoscrolls from graphene, though with very complicated processes to keep the material pure. A few groups had tried doing the same with graphene oxide, but their attempts were literally deflated. Stein and Amadei first used a common technique called the Hummers’ method to separate graphite flakes into individual layers of graphene oxide. They then placed the graphene oxide flakes in solution and stimulated the flakes to curl into scrolls, using two similar approaches: a low-frequency tip-sonicator, and a high-frequency custom reactor. The tip-sonicator is a probe made of piezoelectric material that shakes at a low, 20Hz frequency when voltage is applied. When placed in a solution, the tip-sonicator produces sound waves that stir up the surroundings, creating bubbles in the solution. Similarly, the group’s reactor contains a piezoelectric component that is connected to a circuit. As voltage is applied, the reactor shakes — at a higher, 390 Hz frequency compared with the tip-sonicator — creating bubbles in the solution within the reactor. Stein and Amadei applied both techniques to solutions of graphene oxide flakes and observed similar effects: The bubbles that were created in solution eventually collapsed, releasing energy that caused the flakes to spontaneously curl into scrolls. The researchers found they could tune the dimensions of the scrolls by varying the treatment duration and the frequency of the ultrasonic waves. Higher frequencies and shorter treatments did not lead to significant damage of the graphene oxide flakes and produced larger scrolls, while low frequencies and longer treatment times tended to cleave flakes apart and create smaller scrolls. While the group’s initial experiments turned a relatively low number of flakes — about 10 percent — into scrolls, Stein says both techniques may be optimized to produce higher yields. If they can be scaled up, he says the techniques can be compatible with existing industrial processes, particularly for water purification. “If you can make this in large scales and it’s cheap, you could make huge bulk samples of filters and throw them out in the water to remove all sorts of contaminants,” Stein says. This work was supported, in part, by the Department of Defense through the National Defense Science and Engineering Graduate (NDSEG) fellowship program. A new kind of nanoscale rectenna (half antenna and half rectifier) can convert solar and infrared into electricity, plus be tuned to nearly any other frequency as a detector. Right now efficiency is only one percent, but professor Baratunde Cola and colleagues at the Georgia Institute of Technology (Georgia Tech, Atlanta) convincingly argue that they can achieve 40 percent broad spectrum efficiency (double that of silicon and more even than multi-junction gallium arsenide) at a one-tenth of the cost of conventional solar cells (and with an upper limit of 90 percent efficiency for single wavelength conversion). It is well suited for mass production, according to Cola. It works by growing fields of carbon nanotubes vertically, the length of which roughly matches the wavelength of the energy source (one micron for solar), capping the carbon nanotubes with an insulating dielectric (aluminum oxide on the tethered end of the nanotube bundles), then growing a low-work function metal (calcium/aluminum) on the dielectric and voila–a rectenna with a two electron-volt potential that collects sunlight and converts it to direct current (DC). For commercialization, billions or even trillions of carbon-nanotube bundles could be grown side-by-side, ramping up the power output into the megaWatt range, after optimization for higher efficiency. For the future, Cola’s group has a three tiered goal–first develop sensor applications that don’t require high efficiencies, second to get the efficiency to 20 percent for harvesting waste heat in the infrared spectrum, then start replacing standard solar cells with 40 percent efficient panels in the visible spectrum. The team is also seeking suitable flexible substrates for applications that require bending. An optical rectenna—a device that directly converts free-propagating electromagnetic waves at optical frequencies to direct current—was first proposed over 40 years ago, yet this concept has not been demonstrated experimentally due to fabrication challenges at the nanoscale. Realizing an optical rectenna requires that an antenna be coupled to a diode that operates on the order of 1 pHz (switching speed on the order of 1 fs). Diodes operating at these frequencies are feasible if their capacitance is on the order of a few attofarads but they remain extremely difficult to fabricate and to reliably couple to a nanoscale antenna. Here we demonstrate an optical rectenna by engineering metal–insulator–metal tunnel diodes, with a junction capacitance of ∼2 aF, at the tip of vertically aligned multiwalled carbon nanotubes (∼10 nm in diameter), which act as the antenna. Upon irradiation with visible and infrared light, we measure a d.c. open-circuit voltage and a short-circuit current that appear to be due to a rectification process (we account for a very small but quantifiable contribution from thermal effects). In contrast to recent reports of photodetection based on hot electron decay in a plasmonic nanoscale antenna a coherent optical antenna field appears to be rectified directly in our devices, consistent with rectenna theory. Finally, power rectification is observed under simulated solar illumination, and there is no detectable change in diode performance after numerous current–voltage scans between 5 and 77 °C, indicating a potential for robust operation. An Immune-Therapy drug delivery system created at Yale that can carry multiple drugs inside a tiny particle is heading toward its first phase of clinical trials for a possible new treatment for cancer. The delivery system, a nanogel developed in the lab of associate professor Tarek Fahmy, can be used for multiple combinations of drugs for many different cancers and some immune disorders. The platform is designed to deliver multiple drugs with different chemical properties. A single particle can carry hundreds of drug molecules that concentrate in the tumor, increasing the efficacy of the drug combination while decreasing its toxicity. Fahmy describes the delivery system as a kind of “rational” therapy, in that it fuses established biological and clinical findings to the emerging field of nanotechnology. “It creates a new solution that could potentially deal a significant blow to cancer and even autoimmune disease in future applications,” said Fahmy, who teaches biomedical engineering and immunobiology. The first use of this delivery system will be a drug known as IMM-01. A multi-pronged treatment for metastatic cancer, it contains two agents: Interleukin-2 (IL-2) and an inhibitor of tissue growth factor (TGF beta). IL-2 amplifies the body’s immune system, while the TGF-beta inhibitor dampens the cancer cells’ ability to hide from the immune system. Because their size and makeup differ greatly, the two agents would normally be incompatible. Fahmy, however, developed a novel biodegradable gel that can contain both drugs and then release them in the tumor. TVM Life Science Ventures VII is providing funding to Modulate Therapeutics Inc. to develop the drug to clinical proof of concept. Modulate secured the rights to IMM-01 from Yale and the Yale start-up company Immunova L.L.C., which was co-founded by Fahmy, Johns Hopkins University professor of oncology Ephraim Fuchs, and entrepreneur Bernard Friedman. Yale’s Office of Cooperative Research (OCR) helped launch Immunova in 2012 and develop Fahmy’s drug delivery technology. Fahmy is a member of the Yale Cancer Center. “It’s great to see this technology moving forward to the clinic, and we’re hopeful that this will be the first of many life-saving drugs to use this technology,” said Dr. John Puziss, director of technology licensing in OCR. Storing energy from sunlight or wind inside the bonds of a hydrogen (H2) molecule would let intermittent renewable energy power fuel cells, providing electricity on demand. The scalable production of H2, created by splitting apart water (H2O), depends on how well the catalysts drive the reaction. Thus far, platinum catalysts are the best, but the metal’s scarcity and cost is problematic. A layered material shows great promise as a low-cost alternative. Scientists showed that a microwave synthesis technique helps create the new material, a nanostructured molybdenum disulfide, and gives the catalyst an improved ability to produce hydrogen. Microwave-prepared molybdenum disulfide material has the potential to be an affordable alternative to the expensive platinum catalysts that are currently used. The performance exceeds that of MoS2 materials made via other synthetic methods. The blueprint for the “hydrogen (H2) economy” is to convert energy from renewable sources, such as sunlight or wind, and store it as chemical energy in the bonds of the H2 molecule by splitting water electrochemically. The energy then can be released in fuel cells on demand. The scalable production of H2from water depends significantly on the performance of the catalysts that are needed in the electrochemical reaction. Thus far, platinum catalysts are the best performers, but their high cost and scarcity pose limitations to their widespread adoption. A layered material containing molybdenum and sulfur (molybdenum disulfide, or MoS2) shows great promise as a low-cost alternative to the platinum-based electrocatalysts. Prior research has shown that the activity is primarily in sites on the edges of the sheets. Scientists at the Center for Nanoscale Materials have demonstrated that a microwave synthesis technique can help create nanostructured MoS2catalysts with an improved ability to produce hydrogen. Theoretical calculations show the microwave-assisted strategy works partially through a change in the interaction between the hydrogen and MoS2 edge sites when the space between individual layers of MoS2 nanosheets is increased. The increase in space also exposes a larger fraction of reactive sites along the edges of these surfaces where hydrogen can be produced. The performance of the microwave-created MoS2 nanostructured material is among the best of current MoS2 catalysts, requiring only 0.1 V of extra voltage, compared to platinum, for the beginning of hydrogen evolution. Furthermore, the microwave method is more energy efficient than thermal synthesis methods, and it offers the possibility of designing tailored MoS2 catalysts through precise control of the interlayer distance. The above post is reprinted from materials provided byDepartment of Energy, Office of Science. Note: Materials may be edited for content and length. National public-private consortium led by MIT will involve manufacturers, universities, agencies, companies. An independent nonprofit founded by MIT has been selected to run a new, $317 million public-private partnership announced today by Secretary of Defense Ashton Carter. The partnership, named the Advanced Functional Fibers of America (AFFOA) Institute, has won a national competition for federal funding to create the latest Manufacturing Innovation Institute. It is designed to accelerate innovation in high-tech, U.S.-based manufacturing involving fibers and textiles. The proposal for the institute was led by Professor Yoel Fink, director of MIT’s Research Laboratory of Electronics (RLE). The partnership includes 32 universities, 16 industry members, 72 manufacturing entities, and 26 startup incubators, spread across 27 states and Puerto Rico. This is the eighth Manufacturing Innovation Institute established to date, and the first to be headquartered in New England. The headquarters will be established in Cambridge, Massachusetts, in proximity to the MIT campus and its U.S. Army-funded Institute for Soldier Nanotechnology, as well as the Natick Soldier Research Development and Engineering Center. This unique partnership, Fink says, has the potential to create a whole new industry, based on breakthroughs in fiber materials and manufacturing. These new fibers and the fabrics made from them will have the ability to see, hear, and sense their surroundings; communicate; store and convert energy; monitor health; control temperature; and change their color. The new initiative will receive $75 million in federal funding out of a total of $317 million through cost sharing among the Department of Defense, industrial partners, venture capitalists, universities, nonprofits, and states including the Commonwealth of Massachusetts. The initial funding will cover a five-year period and will be administered through the new, independent, nonprofit organization set up for the purpose. The partnership, which will focus on both developing new technologies and training the workforce needed to operate and maintain these production systems, also includes a network of community colleges and experts in career and technical education for manufacturing. “What makes this point in time different? The answer is research,” Fink says: Objects that serve many complex functions are always made of multiple materials, whereas single-material objects, such as a drinking glass, usually have just a single, simple function. But now, new technology — some of it developed in Fink’s own laboratory — is changing all that, making it possible to integrate many materials and complex functional structures into a fabric’s very fibers, and to create fiber-based devices and functional fabric systems. The semiconductor industry has shown how to combine millions of transistors into an integrated circuit that functions as a system; as described by “Moore’s law,” the number of devices and functions has doubled in computer chips every couple of years. Fink says the team envisions that the number of functions in a fiber will grow with similar speed, paving the way for highly functional fabrics. The challenge now is to execute this vision, Fink says. While many textile and apparel companies and universities have figured out pieces of this puzzle, no single one has figured it all out. “With a capable manufacturing network in place,” Fink adds, “the question becomes: How do we encourage and foster product innovation in this new area?” The answer, he says, lies at the core of AFFOA’s activities: Innovators across the country will be invited to execute “advanced fabric” products on prototyping and pilot scales. Moreover, the center will link these innovators with funding from large companies and venture capital investors, to execute their ideas through the manufacturing stage. The center will thus lower the barrier to innovation and unleash product creativity in this new domain, he says. The federal selection process for the new institute was administered by the U.S. Department of Defense’s Manufacturing Technology Program and the U.S. Army’s Natick Soldier Research, Development and Engineering Center and Contracting Command in New Jersey. Retired Gen. Paul J. Kern will serve as chairman of the AFFOA Institute. In addition to Fink, the new partnership will include Tom Kochan, the George Maverick Bunker Professor of Management at MIT’s Sloan School of Management, who will serve as chief workforce officer coordinating the nationwide education and workforce development (EWD) plan. Pappalardo Professor of Mechanical Engineering Alexander Slocum will be the EWD deputy for education innovation. Other key MIT participants will include professors Krystyn Van Vliet from the Materials Science and Engineering and Biological Engineering departments; Peko Hosoi and Kripa Varanasi from the Department of Mechanical Engineering; and Gregory Rutledge from the Department of Chemical Engineering. Among the industry partners who will be members of the partnership are companies such as Warwick Mills, DuPont, Steelcase, Nike, and Corning. Among the academic partners are Drexel University, the University of Massachusetts at Amherst, the University of Georgia, the University of Tennessee, and the University of Texas at Austin. In a presentation last fall about the proposed partnership, MIT President L. Rafael Reif said, “We believe that partnerships — with industry and government and across academia — are critical to our capacity to create positive change.” He added, “Our nation has no shortage of smart, ambitious people with brilliant new ideas. But if we want a thriving economy, producing more and better jobs, we need more of those ideas to get to market faster.” Accelerating such implementation is at the heart of the new partnership’s goals. Part of the power of this new collaboration, Fink says, is combining the particular skills and resources of the different partners so that they “add up to something that’s more than the sum of the parts.” Existing large companies can contribute both funding and expertise, smaller startup companies can provide their creative new ideas, and the academic institutions can push the research boundaries to open up new technological possibilities. Research scientists at INM have developed luminous particles that can also withstand high temperatures. When activated by UV light or x-rays, they glow orange red. Everyone knows the small UV lamps at cash desks in supermarkets. They are used to verify whether “big banknotes” are genuine. To do so, colorful snippets light up inside the note. The luminous particles which cause this consist of organic compounds. They are not suitable for high temperatures because, in such cases, the luminous particles disintegrate. They therefore cannot be used to provide counterfeiting protection for objects that are subjected to high temperatures. Now research scientists at INM – Leibniz-Institute for New Materials have developed luminous particles that can also withstand high temperatures. When activated by UV light or x-rays, they glow orange red. The researchers will be presenting their results from 25 to 29 April 2016 in Hall 2 at the stand B46 of the Hannover Messe in the context of the leading trade fair for R&D and Technology Transfer. Engine components in cars, high-grade machinery for the industrial sector or high-value appliances in private households – some of these everyday objects are subjected to high temperatures when used. Original automotive components and the corresponding spare parts are a seal of quality for manufacturers and consumers: For the driver, original components mean that the risk of accident is lower. Originality of the parts can only be proven, if the counterfeit protection also withstands high temperatures and can be read easily. A missing counterfeit protection on forged spare parts guards the original manufacturer from claims for compensation. “For our luminous pigments, we can achieve such temperature stability up to 600 degrees Celsius,” says INM’s Peter William de Oliveira. The developers at INM have succeeded in doing so by using a manufacturing method applying wet chemical processes. “The particles not only fulfill the demands of high temperatures but through the addition of suitable solvents, they can also be converted into printable paste. Consequently, they can easily be printed onto many materials using screen printing, for example,” the Head of the InnovationCenter at INM explains further. Using luminous pigments made of yttrium oxide or gadolinium oxide, printed designs are created in white or transparent that glow orange red in UV light or x-rays. With different manufacturing conditions, particles of between seven and approximately 600 nanometers can be achieved thus alloying the researchers to take different requirements and processes in industry into account. Light from the sun is our most abundant source of renewable energy, and learning how best to harvest this radiation is key for the world’s future power needs. Researchers at KAUST have discovered that the efficiency of solar cells can be boosted by combining inorganic semiconductor nanocrystals with organic molecules. Quantum dots are nano-crystals that only measure roughly 10 nanometers across. An electron trapped by the dot has quite different properties from those of an electron free to move through a larger material. Mohammed and his colleagues are developing lead sulfide quantum dots for optical energy harvesting; these tend to be larger than dots made from other materials. Accordingly, lead sulfide quantum dots can absorb light over a wider range of frequencies. This means they can absorb a greater proportion of the light from the sun when compared to other smaller dots. To make a fully functioning solar cell, electrons must be able to move away from the quantum dot absorption region and flow toward an electrode. Ironically, the property of large lead sulfide quantum dots that makes them useful for broadband absorption—a smaller electron energy bandgap—also hinders this energy harvesting process. Previously, efficient electron transfer had only been achieved for lead sulfide quantum dots smaller than 4.3 nanometers across, which caused a cut-off in the frequency of light converted. The innovation by Mohammed and the team was to mix lead sulfide quantum dots of various sizes with molecules from a family known as porphyrins. The researchers showed that by changing the porphyrin used, it is possible to control the charge transfer from large lead sulfide dots; while one molecule switched off charge transfer altogether, another one enabled transfer at a rate faster than 120 femtoseconds. The team believe this improvement in energy harvesting ability is due to the interfacial electrostatic interactions between the negatively charged quantum dot surface and the positively charged porphyrin. Before the dawn of the new millennium, the then President of the USA Bill Clinton was invited by Science magazine to write an editorial. In the one-page piece, Science in the 21st century, he wrote: “Imagine a new century, full of promise, molded by science, shaped by technology, powered by knowledge. We are now embarking on our most daring explorations, unraveling the mysteries of our inner world and charting new routes to the conquest of disease” . In 2000, the US government firmly kicked off its significant and influential National Nanotechnology Initiative (NNI) program after integrating all resources from Federal agencies, including National Science Foundation, Department of Defense, Department of Energy, Department of Health and Human Services (NIH), National Institute of Standard Technology (NIST), National Aeronautics and Space Administration (NASA), Environmental Protection Agency (EPA), Homeland Security, United States Department of Agriculture (USDA), and Department of Justice. (4) to support responsible development of nanotechnology. The NNI significantly pushes nanotechnology research forward. In 2006, the prominence of nanotechnology research began to exceed medical research in terms of publication rate. That trend appears to be continuing as a result of the growth of products in commerce using nanotechnology and, for example, five-fold growth in number of countries with nanomaterials research centers. The nanoscience and nanotechnology subject category of the Journal Citation Report (JCR) published by Thomson Reuters has increased rapidly. Correspondingly, both impact factors (published by Thomson Reuters) and SCImago Journal Rank values (SJR is published by Elsevier’s Scopus and powered by Google’s PageRank algorithms) of journals in the nanotechnology subject category have increased rapidly . The aggregate impact factor of nanoscience and nanotechnology has been rising at a breathtaking rate, compared with other subject categories, reaching the top 10 after 2011. The hype and hope of nanotechnology challenging many previously unimaginable goals are especially high now, and many believe in forthcoming breakthroughs in the areas of nanomaterial-based diagnostic imaging, complementation of diagnostic tools combined with therapeutic modalities (i.e., theranostics), or nanoencapsulation and nano-carriers of biotechnology products. Today, it is estimated that total NNI funding, including the fiscal year 2014, is about $170 billion. Currently, there are more than 60 countriesthat have launched national nanotechnology programs . Governments and industry have invested millions of dollars in research funding in this rapidly growing field. By 2015, approximately one quarter trillion dollars will have been invested in nanotechnology by the American government and private sectors collectively. The continuous strategic investment in nanotechnology has made the United States a global leader in the field. Ten years ago, when AAAS celebrated the 125th anniversary of the journalScience, it invited the President of Chinese Academy of Science (CAS) Chunli Bai to write an essay for the special section Global Voice of Science. The CAS President Chunli Bai’s essay, Ascent of Nanoscience in China  described the then development of nanotechnology and nanoscience in the country and openly announced the government’s ambition to compete with other countries in the field. In 2006, the Chinese government announced its Medium and Long-term Plan for the Development of Science and Technology (2006–2020), which identified nanotechnology as “a very promising area that could give China a chance of great-leap-forward development”. The plan introduced the new Chinese Science & Technology policy guidelines, which were later implemented by the Ministry of Science and Technology (MOST) that operates Nanoscience Research as a part of the State Key Science Research Plans. So far the Nanoscience Research program has invested about 1.0 billion RMB to support 28 nanotechnology projects. All of these endeavors led to the recent significantly rapid rise of nanotechnology in China as evidenced by its publications, industrial R&D and applications in the field. The rapid development of nanotechnology-based science and technology in China attracted worldwide attention including from Demos, one of the UK’s most influential think tanks. Led by Wilsdon and Keeley, Demos completed an 18-month study, interviewing many leading scientists and policy makers of 71 Asian organizations, including two well-known Chinese nanotechnology academics Dr. Chen Wang (the then Director of National Center for Nanoscience and Technology) and Academician Zihe Rao (Director of CAS Institute of Biophysics). After completion of the project, Wilsdon and Keeley published their findings in the book, China: The next science superpower?” . The authors wrote, “China in 2007 is the world’s largest technocracy: a country ruled by scientists and engineers who believe in the power of technology to deliver social and economic progress. Right now, the country is at an early stage in the most ambitious program of research investment since John F Kennedy embarked on the race to the moon. But statistics fail to capture the raw power of the changes that are under way, and the potential for Chinese science and innovation to head in new and surprising directions. Is China on track to become the world’s next science superpower?” Indeed, in recent years, China has emerged not only as a mass manufacturer, but also as one of the world’s leading nanotechnology nations. Many nanomaterial-based semiconductor products come from China and the country dominates in the nanotechnology area of most-cited academic articles: the top eighteen out of the twenty scholars are of Chinese origin . With strong governmental and private sector supports, nanotechnology and nanoscience R&D has developed rapidly in both the USA and China. As shown in Fig. 1A, from 2003 to 2013, the USA led in the area of global nanotechnology publications in terms of the numbers of papers and their quality determined by the number of citations and H-index. China followed USA in the field. For instance, the total nanotechnology publications from USA were 160,870 with total citations of 4056,278, whereas, China published 154,946 papers with total citations of 2049,072. The quality of an article is usually judged by the number of citations it receives, although other measures such as the number of downloads are becoming more accepted and used . The leading countries that published most nanotechnology-related papers and their research focuses (2003–2013). (A) The publications and their quality analysis; the comprehensive normalized values are calculated by the weighted statistics. (B) Key research focuses of the top countries; The keywords are ranked according to their use frequency; (C) publication ratio of China to USA in the selected areas. When the ratio is <1, it indicates that USA is leading in the area, and vice versa. C also indicates that China produced more nanotechnology papers than USA did after 2010. Based on the total number of publications and related citations, we have used weighted statistics to calculate the top countries actively involved in nanotechnology research (see original publication for full details). The statistics show that USA ranks number one, followed by China, Germany, Japan, Korea, France, UK, India, Italy, Spain, Taiwan (China), and others (Fig. 1A). EU countries are not too far behind in the field. Further analysis indicates that the number of nanotechnology-related publications increased from 23,957 in 2003 to 107,371 in 2013 world-wide (an increase of 4.48-folds). Among them, 3592 and 30.479 papers were contributed by China in 2003 and in 2013, respectively, that is an increase of 8.49 folds, which is about 2-fold higher than the global publication increase rate. 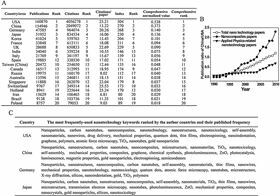 Bibliometric data of twenty leading nanotechnology journals shows that the USA is leading in nanotechnology research by far (see original publication for full details). The USA contributed 22,067 papers to the twenty journals from 2003 to 2013, whereas, China only published 3421 papers in these journals. If the analysis is limited to papers published in journals with an impact factor >20, the USA originated 1068 papers, followed by EU countries Germany (221), UK (193), France (149), and finally Japan (121). China only produced 76 papers with an impact factor >20, demonstrating that China has some significant hurdles to overcome to join the world’s top countries in nanotechnology development. Interestingly, China is not lagging behind world leaders in all areas, for example, the gap between the USA and China is narrower in the field of nanomaterial research. Publications from China in Advanced Materials, Advanced Functional Materials, and Angew. Chem. Int. Edit. are not much less than those from the USA. In fact, China is leading in nanocomposites, chemical synthesis, and photocatalysis research (Fig. 1B and C). Chinese scientists published 1712 and 1580 papers in chemical synthesis and photocatalysis (from 2003 to 2013), respectively. The numbers exceed those from India, South Korea, Japan, USA, France, Germany, UK and Italy combined, suggesting that Chinese researchers have evolved their own research focuses and strengths over the years. On the other hand, this fact may also indicate an over-investment of resources in this area. A list of the top ten universities and institutes world-wide (see original paper for full details), Top 10 Universities for Nanotechnology and Materials Science (U.S. has 5 in the Top 10) as well as those located within USA or China who contribute the most nanotechnology publications, reveals that the authorship of China’s nanotechnology publications is mostly concentrated in a small group of prestigious institutes and universities, reflecting the more centralized governance of China science, while authorship in the USA is more widely distributed. Indeed, the CAS possesses more resources than other competitors in China. The geopolitical differences between the USA and China are also reflected in nanotechnology-related patent applications and industrialization. The numbers of nanotechnology-related patent applications to the US Patent and Trademark Office (USPTO), or the State Intellectual Property Office of China (SIPO) have increased from 405 in 2000 to 3729 in 2008 in USA, or from 105 in 2000 to 5030 in 2008 in China . According to the China Patent Abstract Database managed by the SIPO, there were 30,863 nanotechnology patent applications from 1985 to 2009, and most of them were published after 2003. The central government has already built several state-level nanotechnology R&D incubators or bases, including the National Center for Nanoscience and Technology of China in Beijing, The State Engineering Research Center for Nanotechnology and Applications in Shanghai, National Institute of Nanotechnology and Engineering in Tianjin, Zhejiang–California International NanoSystems Institute, International Innovation Incubator of Nanotechnology, in Suzhou. In general, Beijing and Shanghai remain the two dominant nanotechnology centers, followed by Jiangsu and Zhejiang, reflecting the regional divergence of Chinese nanotechnology development . The China–USA relationship is as compelling as it is complex. Approximately, one out of ten professionals in Silicon Valley’s high-tech workforce is from mainland China . In today’s global economy, the two great countries compete with each other in nanotechnology in a parallel and compatible manner. Historically, the United States has led the global high-tech and nanotechnology fields. However, the gap between USA and China in nanotechnology has narrowed significantly in recent years and American nanotechnology leadership faces challenges from all over the world. With improved investment in research infrastructure and funding, China is sustaining the fastest economic growth in the world. Citizens’ participation in nanoscience and nanotechnology-related consensus conferences or stakeholder dialogues has become normal. This has not only had a significant impact on nanotechnology development in China, but also is democratically legitimate. Interest-based civil society interventions play an important role in the polycentric governance of nanoscience and nanotechnology to ensure that the related policies and regulations are made prudently after open argument and discussions . It would be interesting to watch, debate and decide which type of governmental system, the centralized one-party or the almost equally-divided two-party system, can more efficiently and effectively utilize public resources to produce nanotechnology products that better serve their own taxpayers, and the worldwide community as well. *Fuzhou University and Rutgers University. The authors are very grateful for supports fromChina MOST grant 2015CB931804 and NSFC grant 81273548 (LJ), 81571802 (YG), 21275002 (ZW); and US NIH grants (PJS)R01 AI117776 (NIAID/NIH), R37 AI051214 (NIAID/NIH), R01 CA155061 (NCI/NIH), andU54 AR055073 (NIAMS/NIH); the Graduate Student Fellowship Award from the American Association of Pharmaceutical Scientists Foundation (HYD).